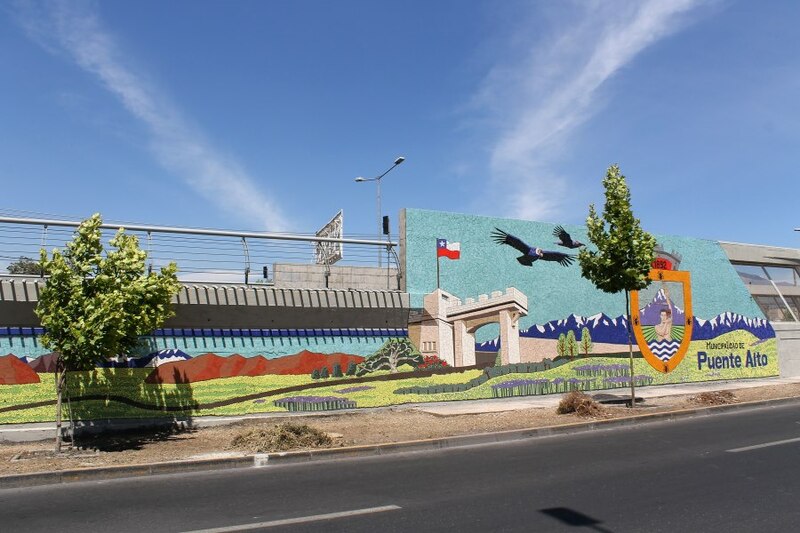 Puento Alto Metro in Chile: A Station or a Mosaic Museum? Home / Blog / Puento Alto Metro in Chile: A Station or a Mosaic Museum? If you get to use Puento Alto’s metro station, you might not recognize it anymore. 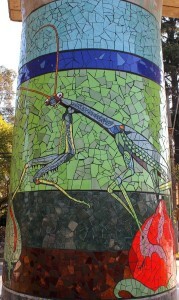 Manuel José Ossandon, the mayor, gave artist Isidora Paz López the challenge to transform the 84 pillars of the station from dull grey to vibrant mosaic colors as a gift to his community. Isidora Paz López was skeptical at first. She had completed two long walls in the station before she was given this new challenge. It was the first time that mosaic was seen in a metro station in the country. She thought about it again and accepted the project. The artist is not working alone of course; she has team of 32 people divided into 4 groups. The Artists who design and implement the images in the mosaics, the Helpers who work with the Artists helping in the creation, the Background group, who fill the designs with solid color mosaics, and finally the Grouting group. The crew works 6 hours a day from Monday to Friday. The image designs are taken from the area’s nature. The aim is to help re-connect the community with its own culture and surroundings. The team uses a thick black line to make their images pop…and it works very well! It takes around 16 persons and 2 weeks in order to achieve a column and everything is done onsite. The community’s response was outstanding. People stop to give their opinion and interact with the team. According to general feedback it seems that the team will grow and work on similar sites because now every municipality will get jealous! This is a great way to incorporate art in people’s everyday lives and offer them a change from routine. What do you think? Would you suggest a comparable project to your own municipality?